People walk around on the University of Maine campus in Orono last year. Following about a decade of steady growth in the number of students at Maine’s community colleges and a corresponding drop at the state’s public universities, the enrollment patterns have flipped in recent years. Compared with all state university and community college systems in New England, the University of Maine System recorded the largest year-over-year enrollment increase this past fall. Its count of full- and part-time students rose 2.5 percent while the Maine Community College System’s dropped 1.8 percent. 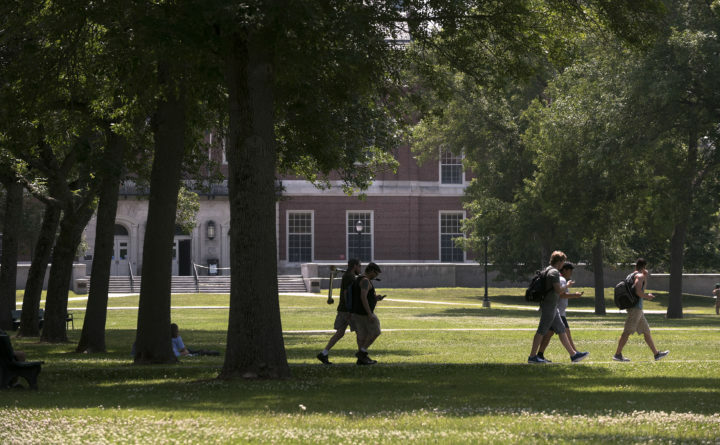 The overall economic environment could explain the recent switch, said Wendy Lindsay, a researcher with the New England Board of Higher Education, which assembled the data on enrollment changes at New England’s public universities and community colleges. “The economy’s better, so fewer people enroll in community colleges,” she said. The drop in enrollment at Maine’s community colleges — which offer associate’s degrees and professional certificates — has corresponded with a steep drop in the state’s unemployment rate, said Helen Pelletier, a vice president and spokeswoman for the Maine Community College System. Between 2002 and 2011, the number of community college students in Maine grew almost 77 percent, to nearly 18,000. Since then, the student count has fallen nearly 7 percent, to 16,700, according to figures compiled by the community college system. Still, that figure is 64 percent higher than enrollment in 2002, when the Maine Community College System started to take shape as it exists today. Trends on individual campuses have varied over time. In addition to the official student count, Pelletier said, the community colleges provided training to 3,500 workers and 100 businesses last year. This year, the system expects that number to be higher. The system is also focusing on retaining more of its enrolled students. It was awarded a Kresge Foundation grant in 2016 to join Achieving the Dream, a national nonprofit focused on improving community colleges’ student outcomes. 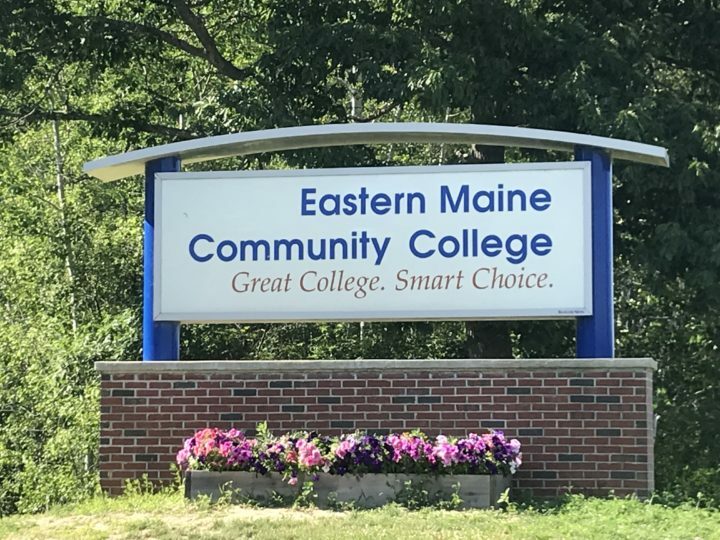 Eastern Maine Community College's welcome sign. The University of Maine System, meanwhile, has seen its enrollment stabilize in recent years, as the system has started awarding more of its financial aid in the form of grants rather than loans, as a growing number of high school students have enrolled in college-level courses and as the University of Maine has stepped up its recruitment of out-of-state students. The enrollment of about 29,700 students in the fall of 2018 is still lower than the universities’ enrollment of more than 34,000 in 2002, but it’s rebounded a bit from its low point of nearly 29,000 students in 2015. Trends on individual university campuses have varied. In 2014, according to the university system, more than half of the financial aid awarded to students was in the form of student loans. Now, the majority of aid, 55 percent, doesn’t have to be repaid. “We froze tuition for six years and continue to cap adjustments at the rate of inflation so the real cost of higher education in Maine does not grow faster than people’s ability to pay,” said Dan Demeritt, the university system’s spokesperson. Two programs — the Promise Initiative and the Flagship Match — have also helped. Through the Promise Initiative, 283 first-year students from Maine are attending college at the university system’s smaller campuses for free. Through the Flagship Match program, eligible out-of-state students can attend the University of Maine for the same price that they would pay at their home state’s flagship university. Early college — which allows high school students to earn an associate’s degree or up to two years of college credit while still in high school — as well as adult learning programs and online courses are also boosting university system enrollment. Early college enrollment grew by 31 percent between the fall of 2017 and fall of 2018, according to the university system. Pending approval of Gov. Janet Mills’ two-year budget, the university system will receive additional funding to help boost early college enrollment more to reach the system’s goal of 5,000 enrolled high school students by 2022. 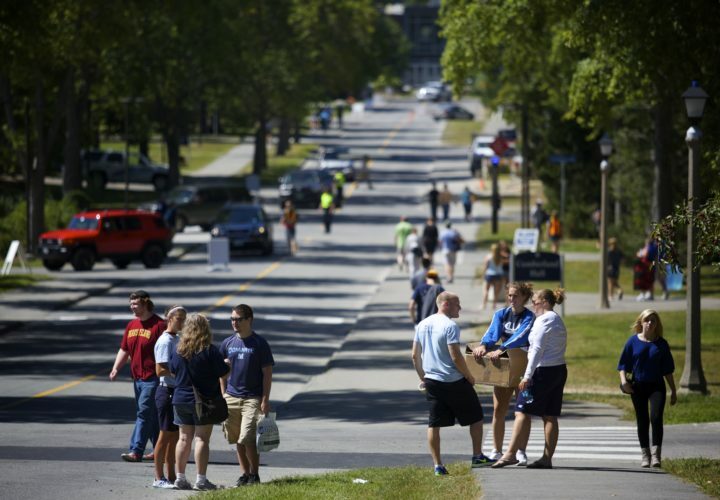 University of Maine students move into the Orono campus to start the 2014 school year, Aug. 29, 2014. The university system’s enrollment has stabilized even as the number of high school graduates in the state falls. In the coming years, that trend will continue, Lindsay said. The number of Maine high school graduates is expected to drop 16 percent between the 2016-17 and 2031-32 school years, she said. About 60 percent of Maine high school graduates go on to higher education, a rate that hasn’t changed appreciably in recent years. If Maine’s universities and community colleges stand a chance of maintaining their numbers, Lindsay said, they would focus on recruiting a greater portion of high school graduates. With more initiatives that allow high school students to earn college credit before graduating, Maine university and community college systems have already started doing that, she said.